Seven of the eighteen Android phones have never run a current version of the Android OS. Just how behind the times is your Android handset when it comes to operating system updates? If I were a betting man, chances are good that if you have an Android handset then even if it is within its two-year contract period that it's one or more versions behind the times. According to data pulled together by Michael DeGusta ofthe understatement, millions of Android users still bound by a contract can't get access to the latest version of Android, and as a result 'consumers get screwed' out of getting the full value from their handset. 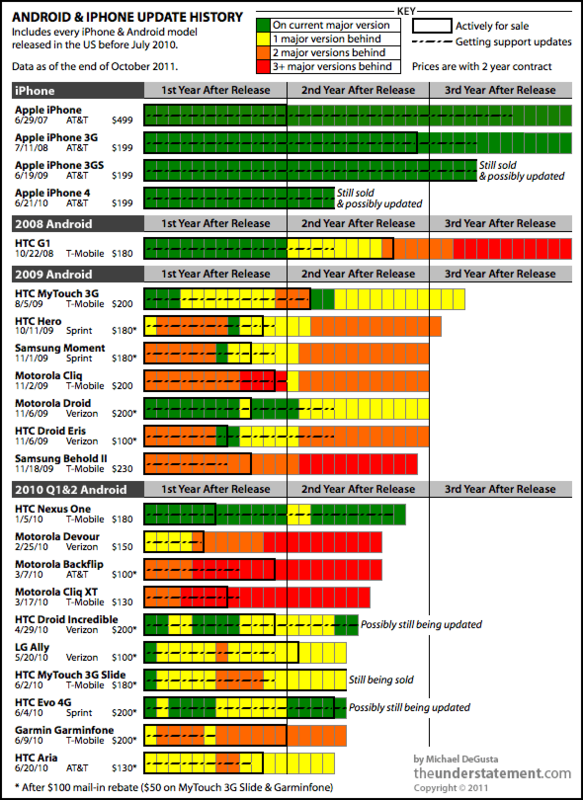 The update history graphic that DeGusta drew up is goes to show just how depressing a state most Android users are left in. It's simply incredible that some handsets (such as the Motorola Cliq or Samsung Behold II) spent their entire time being two of three versions behind. That's simply appalling. I can think of another reason - PEOPLE WERE PROMISED UPDATES FOR MANY OF THE HANDSETS! Compare this to how Apple handles the iPhone ... users see at least two years of updates and support patches. Obviously a big part of the problem is that Android has to go from Google to the phone manufacturers to the carriers to the devices, whereas iOS just goes from Apple directly to devices. The hacker community (e.g. CyanogenMod, et cetera) has frequently managed to get these phones to run the newer operating systems, so it isn't a hardware issue. To me, it seems like no one - Google, the OEMs or the carriers - care about whether users get updates. The OEM and carrier have been paid for the handset so there's just no incentive on their part to push upgrades. The pre-iPhone way of doing things (not pushing updates to handsets) is alive and well outside of Apple.